To overcome your fears, you must first identify them. Take the "Fear of" quiz to find out what barriers are holding you back from achieving greater success. Whether we want to admit it or not, we are all hiding from something. We hide from criticism, from judgment, from differences; even more detrimentally we even hide from who we really are. But why? Perhaps our parents didn’t think our chosen career was a good one, or perhaps someone close to us said our ideas were stupid. Maybe we grew up in an environment that only admired certain types of people, or maybe we simply were not comfortable with being different. Do you let what other people think hold you back, or is there something more? Identify the barriers standing in your way. Face it – it’s much easier to go with the flow, do the popular thing and not to rock the boat. That is until one day we wake up and realize with every breath we take, we’re actually suffocating. With every step, we stumble. With every feeling , we are empty and unfulfilled. The irony of it all? All that time and energy we put into trying to be what others wanted won’t get us what it is that we wanted – success, happiness, to fit in, or be accepted. It’s when we step into our true power that we discover true meaning and success. Purpose might sound like a warm and fuzzy, but understanding your purpose provides clarity in a way that can’t be described. Purpose creates a new lens from which to view personal and professional paths and purpose aligns what we do, with who we are. 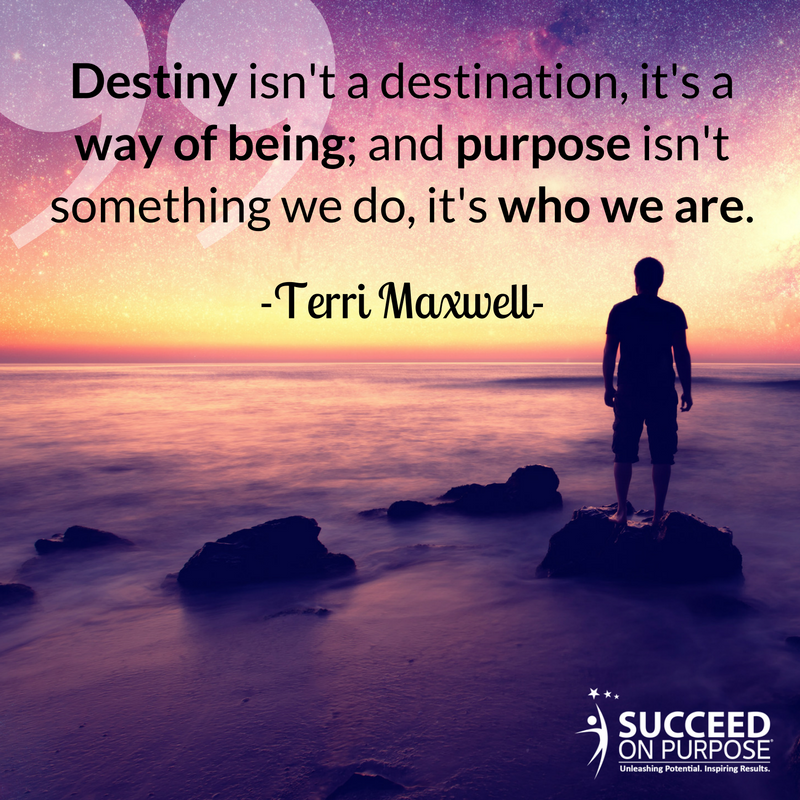 Finding your purpose is the first step to taking that breath of freedom and to start becoming who you were meant to be. The level peace that comes from stepping into purpose is only the beginning. When you truly embrace purpose you go from doing what others think you should do, to doing what you love. 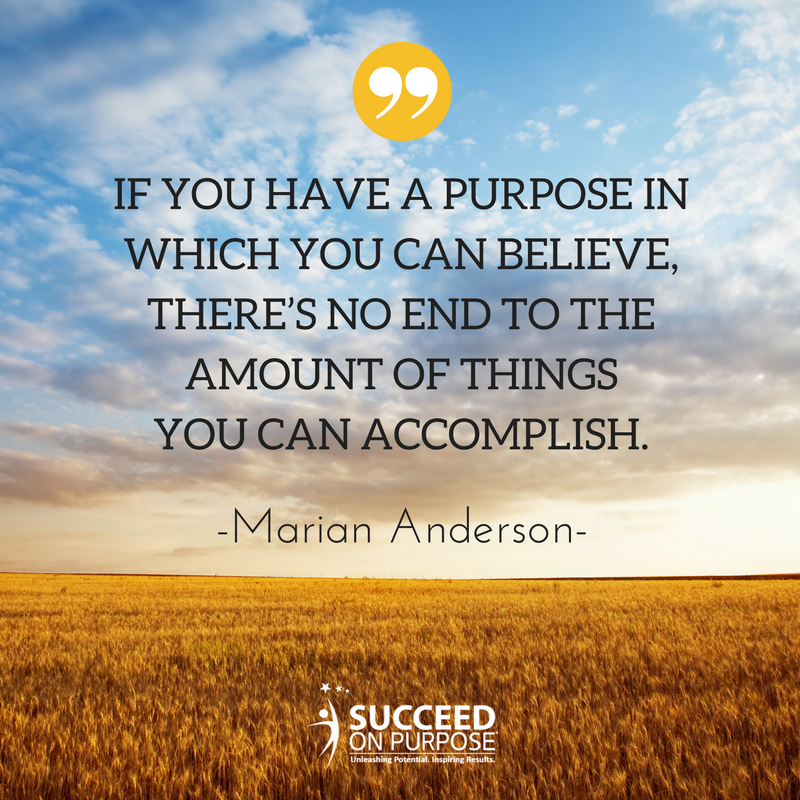 Once career is aligned with purpose, fulfillment and success abound. That doesn’t mean every day is a breeze, or that you’ll love every day. There will still be good days and bad days, and ups and downs. The difference is, every day, you’ll know WHY you’re doing what you’re doing. Think about that. Have you ever wondered why you chose a particular career path, or why you enjoy certain activities more than others? That’s the type of alignment you’ll have. You won’t feel uncertain or second-guess your path or the direction your life is taking. In spite of challenges that arise, you’ll know you’re on the right path, and you’ll know how to navigate those challenges. Everything needed to live an authentic and meaningful life is already within you. It’s simply a matter of uncovering it. Don’t let fear stand in the way of getting real with yourself. By giving in to fear, you deprive yourself of the opportunity to step into true power and achieve happiness. Find your purpose, boost your confidence, overcome the fear, and embrace your true self.